It happens to the best of us! Your inspecting the work site and you discover an issue of non-compliance. This is what happened to a recent customer. They had four spots on their roof that were clear OSHA violations. 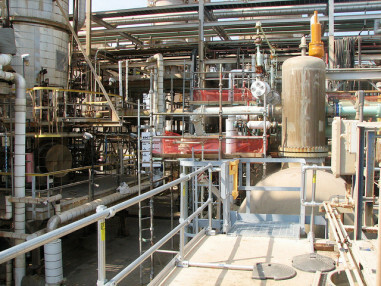 OSHA requires that workers exposed to a fall hazard MUST have fall protection. 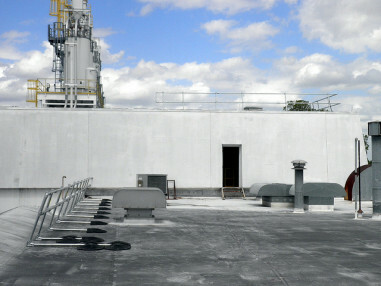 Industry standard says that protection must be in place for anyone working within 15 feet of the roof edge. The best solution, and the simplest, is to install roof edge guard railing around the trouble spots to eliminate the fall hazard completely. A member of our staff flew to site an met with the customer to consult about the rooftop railing arrangement. 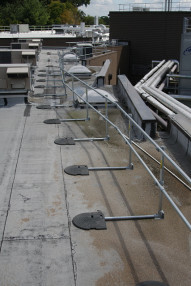 We helped identify the areas of the roof that absolutely required fall protection railing. For budgetary purposes, they could only apply protection where it was absolutely necessary. Our sale engineer identified four key areas that are pictured in this blog post. Each section shows a before and after of the section that was being protected with KeeGuard roof edge railing. We recognize that surprises do happen, so the secondary lesson is this: if you get a surprise from OSHA, Simplified Safety has your back. Call our sales engineers and we will work closely with your team to provide the best fall protection solution that fits your budget and satisfies the fall protection criteria.